Took me some time, but better late then never! David Kanter shows interesting architectual differences between AMD and NVIDIA GPUs. Please read the ReadMe.txt / LiesMich.txt to understand how to configure the Tool properly! If it does not work, please disable the Steam Overlay, Fraps, XFire and all other Gaming Overlay Applications! If you have installed a newer Catalyst version ever and go back to an older Catalyst, OpenCL uninstall will not remove all OpenCL files and this could cause your OpenCL to be in a broken state. If you want 100% sure, run the DirectComputeBenchmark_v0_45b in OpenCL mode for the GPU and see, if it works. - for Metro 2033 & Battlefield 3 please use the Option Mouse Cursor Fix and you may have to ALT+TAB out/in the game to make that work! Ich hab hier mal eine Anleitung gepostet! Here is our patch to enable MSAA on ATI/AMD Graphics cards. The achived MSAA with this patch is faster, than the MSAA you can force via the Catalyst Control Panel and it let the Game Engine detect a ATi/AMD based card for applying proper IHV optimizations. This Patch has only been tested with the Batman Arkham Asylum Update V1.1 - so please install the update first! UPDATE: This is meant for benchmarks & testing, as this patch will disable the save game functionality! AMD's Radeon 5xxx mit neuem anisotropen Filters - besser als NVIDIA's GT200 ? Das wurde ja auch Zeit! Endlich bekommt man gute Bildqualit�t. TweakersNet haben den Vergleich zwischen RV8xx (Radeon 5xxxx), RV770 (Radeon 4xxx) und NVIDIA's GT2xx. Here is a our patch... have fun and please read the howto.txt file in the patch archive! BTW. I think the Catalyst Team has to put a fix in their drivers, for the last sequence of the demo. Since I was at the OpenGL BOF at SIGGRAPH where this was discussed, I would like to clarify a bit of what was mentioned. First, there were two current paths for OpenGL on Vista mentioned. The first one is a DX wrapper, with its potential performance shortfalls and lack of extension support. The second path was a traditional ICD which when activated would force the desktop out of the compositing mode, but would allow performance and extensions. Second, 3DLabs, ATI, and NVIDIA all pledged that they were dedicated to work with Microsoft to add the additional support necessary to make ICDs work seamlessly with the rest of the OS. There was an open request to have developers contact their Microsoft reps to express any concerns that they have over this. 1. OpenGL support on Vista will run through a slow D3D wrapper. 2. OpenGL on Vista will not support the compositing desktop. 3. OpenGL will have support for the compositing desktop on Vista. 4. 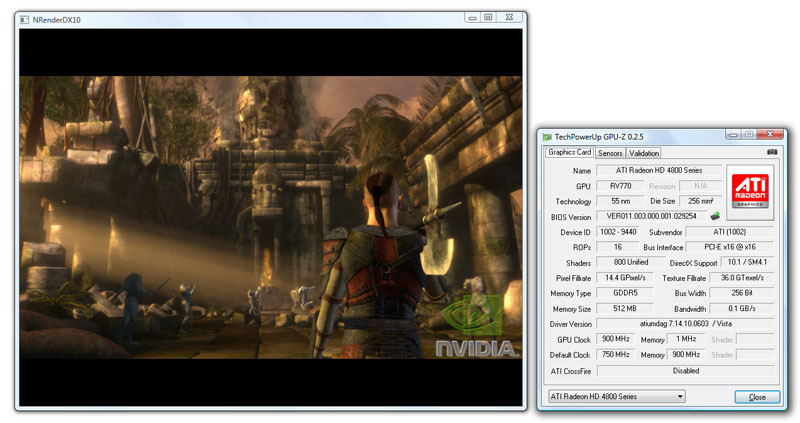 Vista will support high-performance OpenGL ICDs. Obviously, they all need qualifiers, and are not simultaneously true. This unfortunately makes it too easy to confuse developers. Please get the facts straight and if you feel it will impact your products, make whatever Microsoft contacts you have aware of your concern over the issue. Leider ist uns beim Update auf Build 130 ein Fehler unterlaufen. Deshalb folgt jetzt Build 130a. Dieses Update behebt die Fehler auf ATi's R3xx und R4xx Karten, welche beim 'Combination Effect' zu sehen waren. Zus�tzlich wurde die neuste DirectX 9.0c Version (Juni 2005) verwendet.